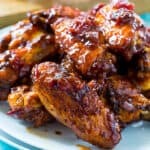 Air Fryer Cherry Chipotle Wings have so much sweet and smoky flavor and cooking them in the Air Fryer is wonderfully quick and easy. 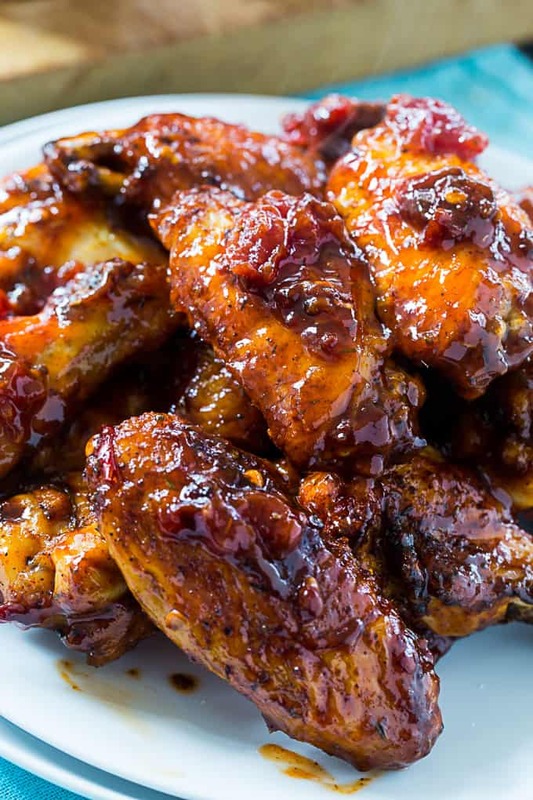 These wings have maximum flavor from both a dry rub and an easy 3-ingredient sauce. Air Fryers are perfect for making the foods you love a little healthier. You can get the crispness of deep frying with very little oil. I find that air fried foods are superior in taste to baked foods, plus they only take a fraction of the time to cook. There is so much to love about Air frying foods. These Air Fryer Cherry Chipotle Wings are first coated in a spice rub made from smoked paprika, dry mustard, chili powder, garlic powder, oregano, and thyme. They are spritzed with just a little oil and then Air Fried for 10 minutes. 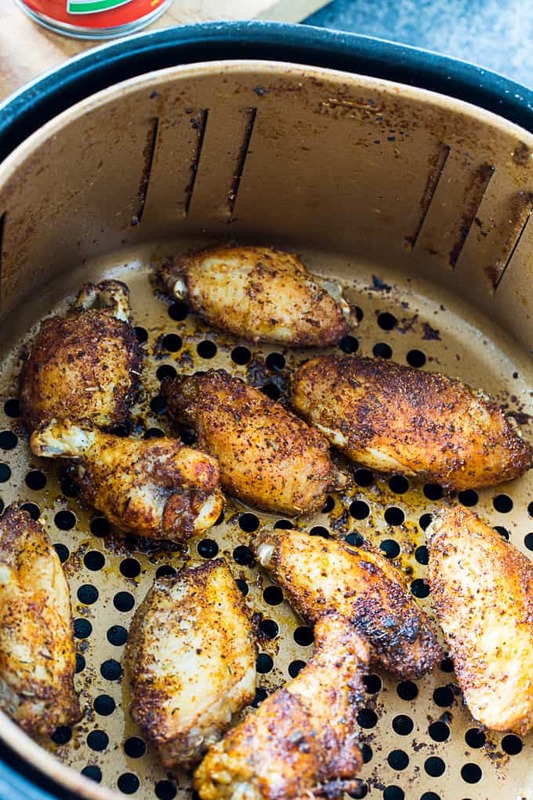 What’s great about cooking wings in the Air Fryer is any fat that renders down drops down through the holes in the Air Fryer basket. Once cooked the wings are tossed with a simple sauce made from chipotle peppers in adobo sauce, cherry preserves, and ketchup. If you wanted to you could change up the flavors of this recipe and use peach preserves or blueberry preserves. There’s no need to cook the sauce. Got to love that! This recipe truly could not be easier. 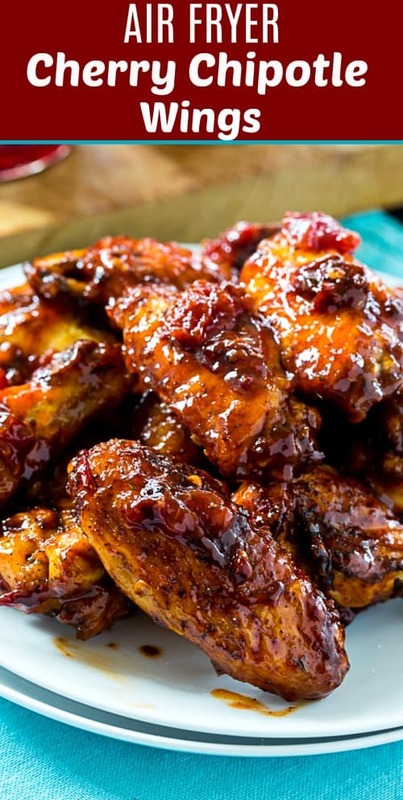 You could serve the wings with a Ranch sauce or Blue Cheese, but they have so much flavor and are so moist and tender, they really don’t need it. 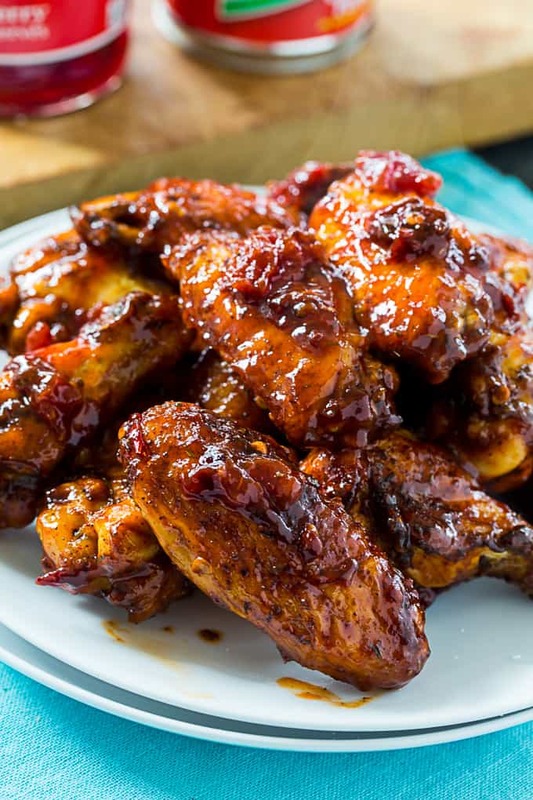 Air Fryer Cherry Chipotle Wings have so much sweet and smoky flavor and cooking them in the Air Fryer is wonderfully quick and easy. If wings are still whole, cut them at both joints and discard the wing tips. Place in a medium bowl and toss with spice mixture. Preheat Air Fryer to 400 degrees. Lightly spray wings with oil. Air fry wings in 2 batches for 10 minutes each. In a medium bowl, stir together chipotle peppers, preserves, and ketchup. When 2nd batch of wings is done, place first batch back in and Air Fry for about 1 minute to warm. Place in bowl with sauce and toss to coat.